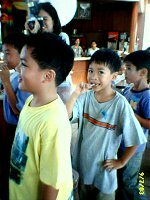 Spent the weekend at the pedia and at a kiddie party in Par 43 (Fort Boni). Adi enjoyed a sweaty, fun-filled morning yesterday at his friend's 7th birthday party at Par 43, a mini-golf course and restaurant in Fort Boni. Yes, that's Adi smiling and showing off the spot where his left incisor used to be. Ali was not around since she paid a visit to her pedia last Saturday. 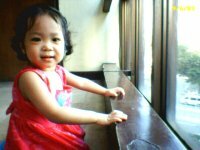 It's amazing how a kid can sense an injection coming up -- she kept walking around the building, exploring different floors of the building just to get anywhere, as long as it was far from her pedia's clinic. Her smile says this photo is obviously a pre-injection shot (no pun intended).